When Brian Pitman asked me to compose a list of what I thought the Top Ten items are in carnival glass, I thought I could work up a list in no time at all. It turns out that this is a little tougher than I thought. Don Moore always did Top Ten lists when he was our top educator in carnival glass. His lists were valid at the time, but Don had no way of knowing how times would change and unheard-of items of carnival glass would continue to surface long after his death. Long after most of us are gone, more rarities will surface. This list will one day be as obsolete as any other list ever created. In the mean time let’s take a look at what (in my humble opinion) are the top ten items of carnival glass as of today. For sake of not being “nit picky” I have grouped several items in the same group. I have also included a list of “honorable mentions” following the Top Ten. Don Moore did the same thing so I guess it is OK for me to do this also. All listed values are approximate based on actual auction figures or private sales. In some cases the numbers are my best guess. No. 10 – Millersburg’s Green Morning Glory Tankard – Two are known. Both were found by Bill and Carole Richards at different times. One currently is in a collection in Kentucky, and the other belongs to Ray Miller from the Millersburg, Ohio area. There are a number of green tumblers known. Value of the tankard is $55-$60,000. No. 9 – Northwood’s Ice Blue and Ice Green Tree Trunk Funeral Vases – Two ice blue and at least four ice green are known. The ice blue are located in Virginia and San Francisco and the ice green reside in Quebec, Wisconsin, North Carolina and San Francisco, CA. As of this date there are none known in aqua opal. Value of the funeral vases is $55,000 and up. No. 8 – Millersburg’s Peacock Radium Amethyst Cuspidor Made from the Master Ice Cream Bowl – Only one of these has ever been found. There is also a marigold example, but it is not in the same class as the amethyst example. 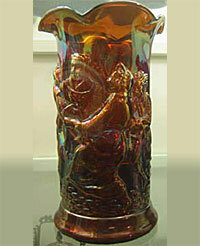 This lone cuspidor belongs to Stacy and Des Wills of Orient, Ohio, Value is about $50,000. No. 7 – Northwood’s Green Wisteria Vase Whimsey Made from the Tankard – No handle is present and the top is ruffled. This is the only Wisteria item ever found in a “non-pastel” color. We know of tankards in ice blue and white and tumblers in lime green. This vase whimsey is located in Ohio where it was found about fifteen years ago. Value is about $50,000. No. 6 – Dugan’s Peach Opal (Ruffled) and Green (3/1 Ribbon Edge) Farmyard Bowls – There is only one peach opal bowl and one 3/1 ribbon edge green bowl. The green bowl has a completely stippled background and is the only Farmyard bowl of any color with this full stippling effect. All other Farmyard bowls have stippling on the bottom half only. 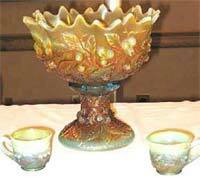 The peach opal bowl is owned by the Whitleys of Houston, TX and the green bowl is owned by Jackie Poucher of Florida. Value is about the same for both bowls at around $50-$65,000. No. 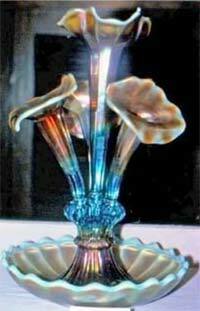 5 – Northwood’s Aqua Opalescent Wide Panel Epergne – Only one known in this color. The epergne resides with the Heckenbergers of Pennsylvania. There are a few extra lilies in this color. Value is $55-65,000. No. 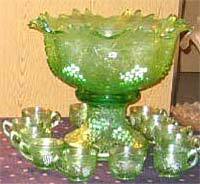 4 – Millersburg’s Green Hobstar and Feather Pulled Vase Whimsey from the Rosebowl – One known in green. There are also two known in amethyst but not of the same value as the green example. Stacy and Des Wills own this one known green example. Value about $70,000. No. 3 – Northwood’s Ice Green and Ice Blue Grape and Cable Master Punch Sets – I know of two in ice green and two in ice blue. I am also aware of one damaged ice green and one damaged ice blue example. The owners of ice green are the granddaughter of the Vinings of Chatsworth, Georgia and the other is in Tennessee. One of the ice blue examples is also in Tennessee. The other ice blue set is in Kentucky. Value of these outstanding sets are in the range of $65-75,000. No. 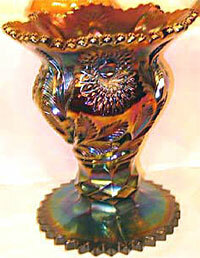 2 – Millersburg’s Peoples Vases in Blue, Marigold, Amethyst and Green – Only one blue example is known and is owned by the Wills of Ohio. They also own the only known marigold example. There are several examples known in amethyst and only one in green owned by the Whitleys of Texas. Most of these have a “stove pipe” unruffled shape. One or two are ruffled. There are several known examples in amethyst that are damaged. Value for perfect examples range from $65,000 to about $100,000. No. 1 – The Number One item(s) in all of carnival glass are reserved for all of Northwood’s Aqua Opalescent Punch Sets. – There is only one known in the Grape and Cable pattern and is owned by the Hamlets of North Carolina. Two Acorn Burr punch sets are known (one is perfect and one is damaged). The perfect example is in Kentucky. There are three perfect examples of Peacock at the Fountain. The owners are Jackie Poucher, Don and Bob Courts of Ohio, and the third is in Kentucky. All of these aqua opal punch sets are only known in the small table size. All have six cups. Value of any of these perfect sets is about $100,000 to $120,000. I have left plenty of room for argument and expect that many of you will disagree with me. The world won’t end tomorrow if you can come up with some examples of which I am not aware. I won’t argue with you because all of this is strictly opinion (mine). Here is a list of some honorable mentions that can also be considered. You won’t find these at a carnival glass auction selling for a few bucks. I am sure the readers could add to this list.